I made a code upgrade to Java 1.5 (5.0) so Java 1.4 is no longer supported. It allows to make code more readable and maintainable. If you have Java (JRE) 1.4 installed, please download and install newer version from here. I hope that you will like new welcome screen from where you can choose any of the main function. With a 'Find All' functionality you can search over opened document(s). Found expressions can be highlighted and you can jump among them. 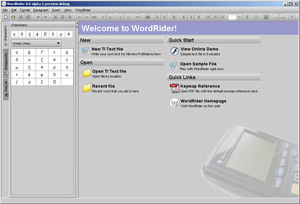 For better convenience you can send any of opened documents (include pictures) directly from WordRider to the calculator via extern application. 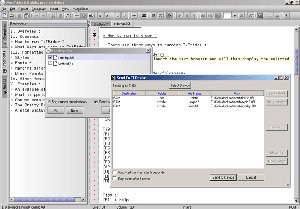 You can choose which application you want to use it for - TI Connect™ Software or TiLP. It's simple and fast as it should be :-). They can be applyed for both selection and paragraph(s). 'Trim Trailing Spaces' removes unnecessary spaces from the paragraph. All of them have associated shortcuts. 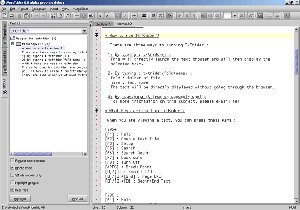 Each tab for editor has associated popmenu for handling its state. It's similar to functions as you know eg. from webbrowsers like Firefox.